Tried and true. 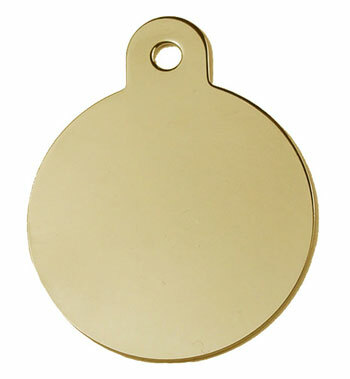 Lightweight gold-plated tag that’s engraved on both sides with all of your pet’s vital stats. Measuring 7/8″ across for the small, or 1.25″ across for the large, the tag can accommodate up to four lines of copy (please type “none” into undesired fields, below). Shipping note: ID tags mailed via the US Postal Service receive FREE shipping. Even though “shipping costs” may appear on your order, we will not charge for any ID tags that are sent via the U.S. Postal Service, only those for which you specify expedited service (UPS next day or 2nd day).